The Waihohonu Hut? Mansion? Palace? At 1.25pm on 21 November 2012 Mt Tongariro let fly with a two kilometre plume of ash emanating from Te Maari Crater. This is the area that erupted on 6 August. The eruption only lasted five minutes but GNS are monitoring the situation. The volcano alert for Tongariro has been lifted to Level 2, which means ‘minor eruptive activity.’ The Aviation Colour Code is changed to red. Flights between Wellington and Taupo are cancelled. A lot of snow has disappeared off the mountain and we now have many people circumnavigating the mountain as well as walking the Tongariro Alpine Crossing. There were several school groups on the mountain, some within one kilometre of the eruption. No injuries are reported. 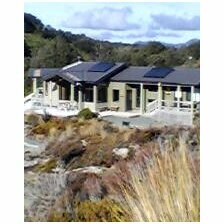 Some years ago a group of us enjoyed my birthday in Ketetahi Hut on the north side of Mt Tongariro. After Monday night’s eruption the hut has holes through the roof, floor and bunks and the water tank is askew. Luckily, it’s winter and there was no one in the hut. The track is blocked with huge boulders. A short and beautiful walk uphill from the hut are the Te Maari Craters, where it was thought the eruptions occurred. However, there appear to be new craters in the vicinity. It’s now up to GNS to determine whether the eruption is steam driven or magma driven. If it’s steam driven then the initial pressure released should subside and we should see less activity but if magma is pushing into the volcano then activity will be sporadic. (Just like in Fire in the Mountain, which will finally be released before the end of the month). GNS will analyse the ash to determine the driver of the eruptions. Wow, it’s always exciting when one of our mountains goes off. At 11.50pm on 6 August Mt Tongariro erupted flinging ash and hot rocks into the air. Although there had been increased earthquake activity in recent weeks and slightly elevated gas signatures there was no real indication that the mountain was anything other than restless. It is thought the incandescent explosions emanated from the Te Mari Craters which are on the northern end of the mountain. Mt Tongariro last erupted in 1897. Volcanic ash has trended east towards Napier and some flights have been suspended. Roads in the area have been reopened after being closed last night due to ash. Police have set out this morning to check that no one is stuck in huts on the mountain. My novel, Fire in the Mountain, is due out in three weeks! Great timing!